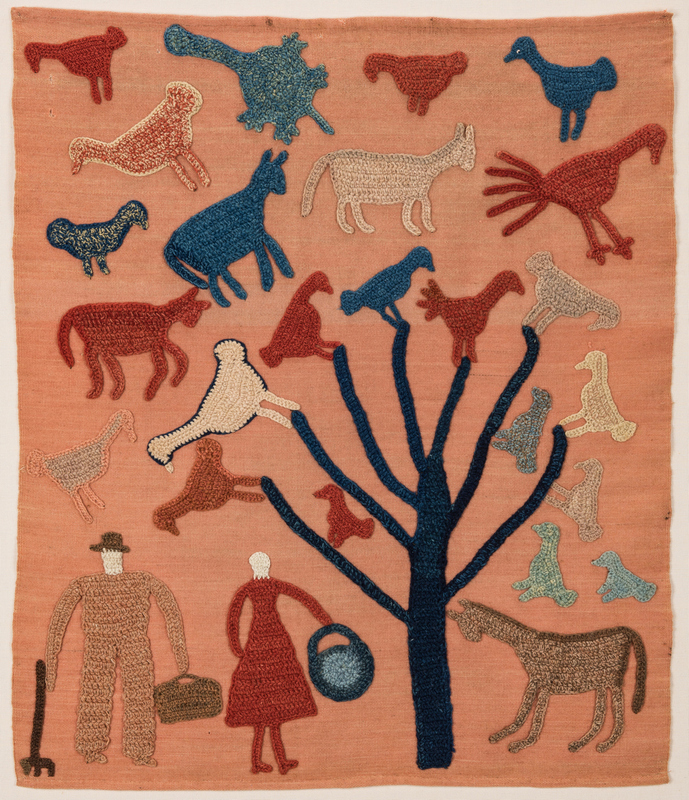 Kate Clayton ("Granny") Donaldson (Brasstown, Jackson County, North Carolina, 1864-1960) hand dyed and spun wool Folk art wall hanging, with "Tree of Life" motif. 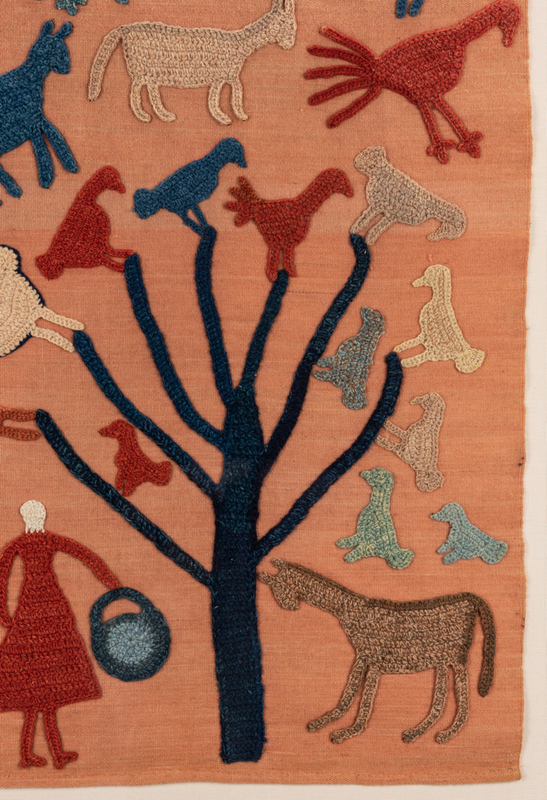 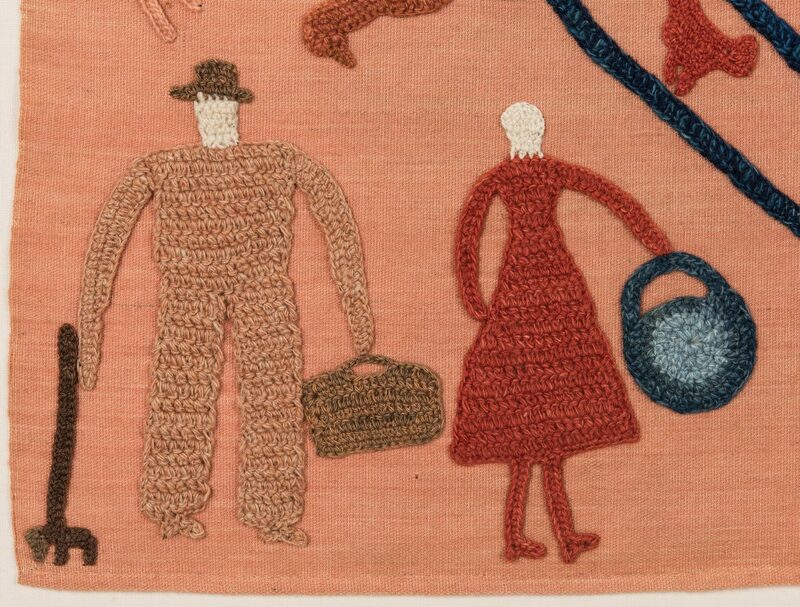 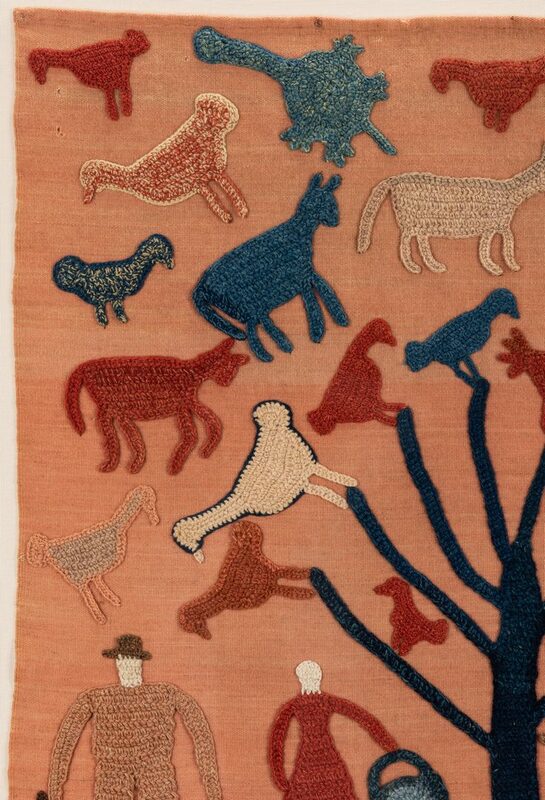 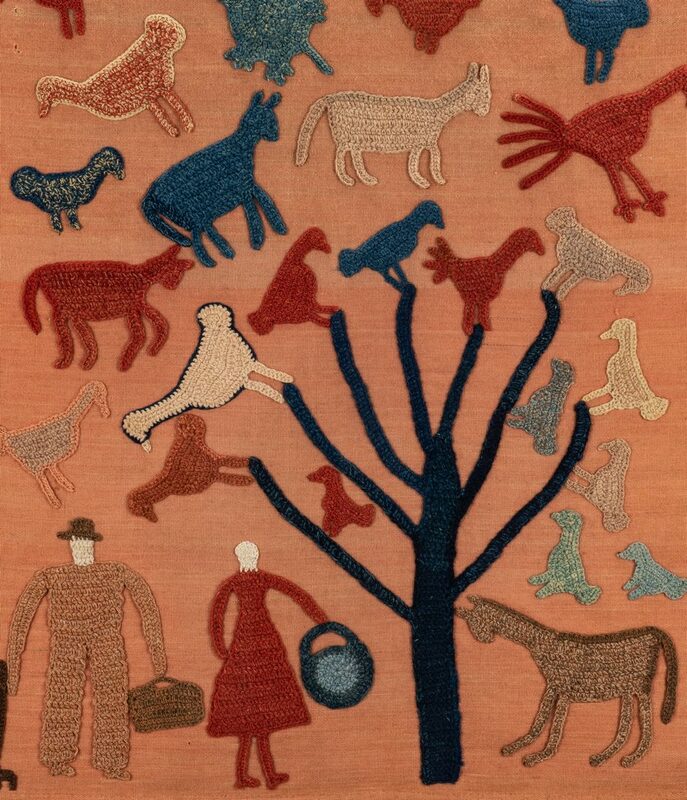 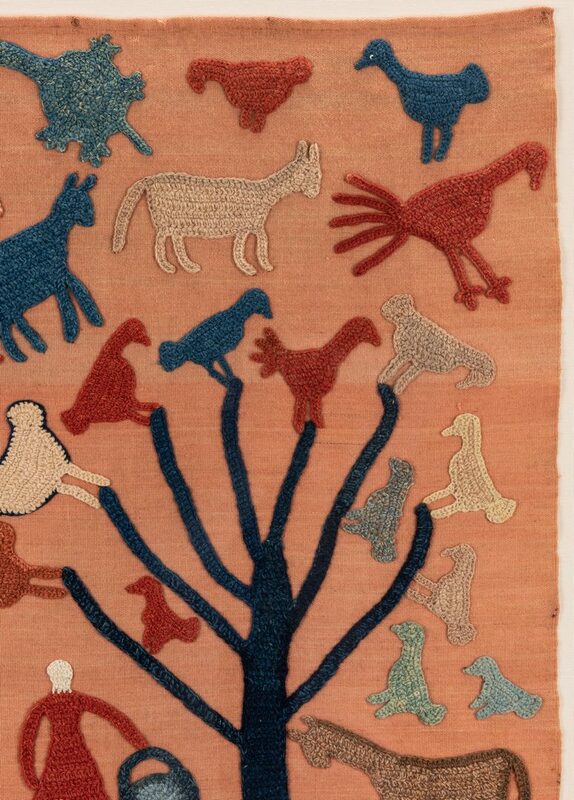 Crocheted large tree with birds resting in its branches, to the left a farmer holding a pitchfork and his wife holding a basket, with other farm animals, birds and a turtle in the sky, all appliqued to a woven wool background panel hemmed at edges and attached to linen canvas. 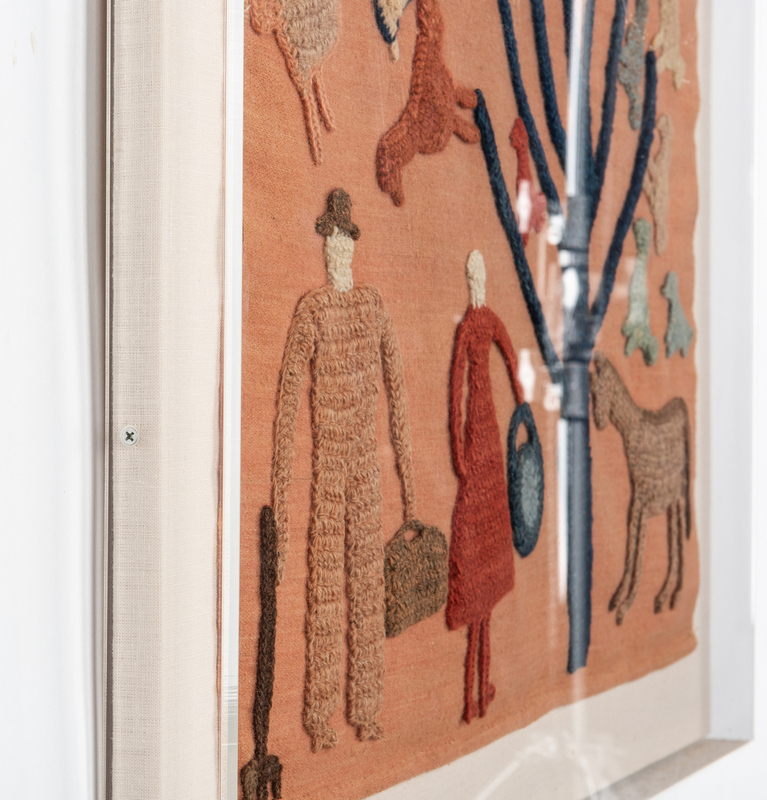 Housed in an acrylic shadow box. Textile – 31" H x 26 1/2" W. Shadow box – 36 3/4" H x 31 1/2" W x 2 1/4" D. American, early,mid 20th century. 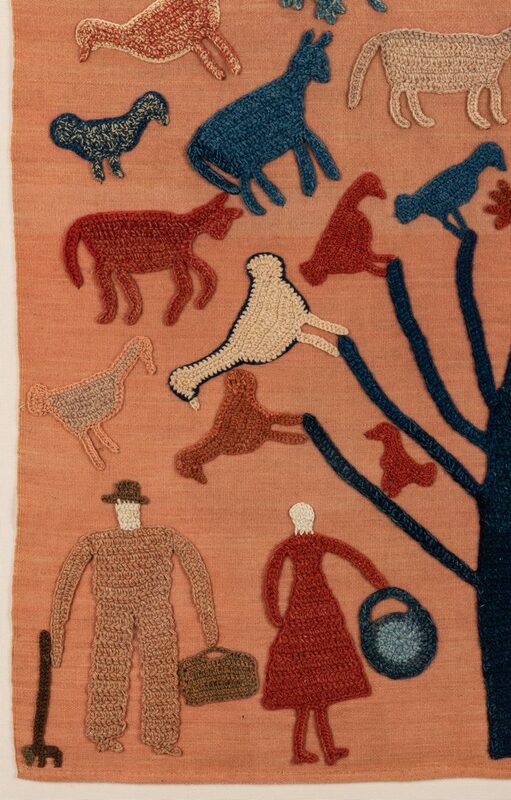 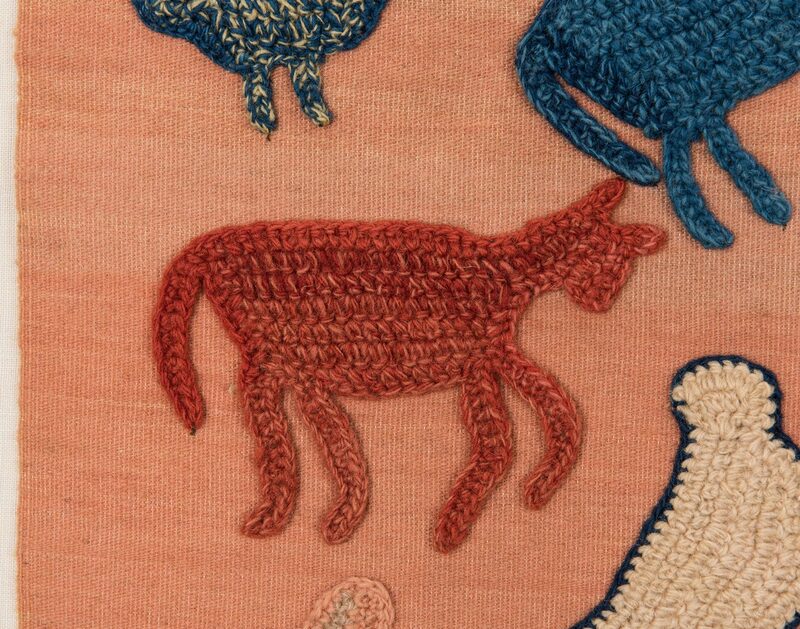 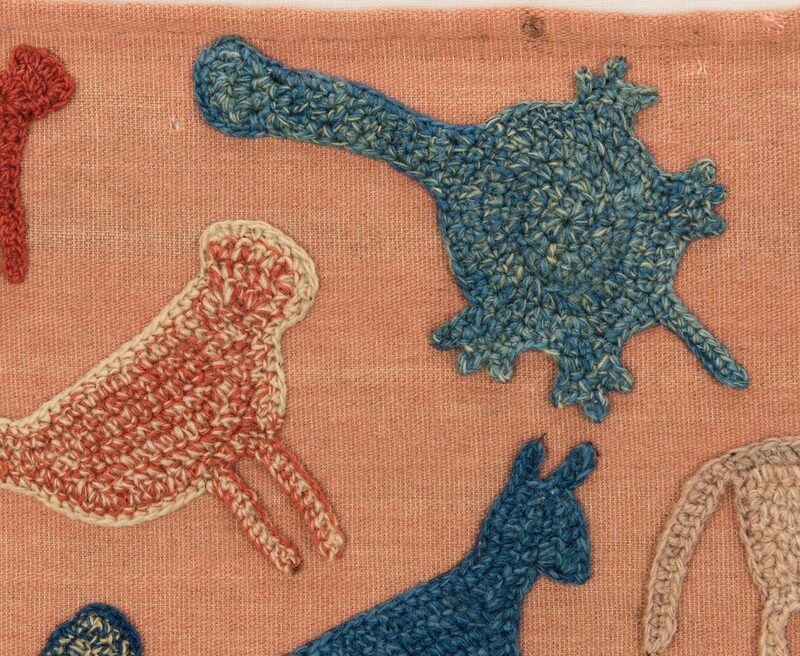 Note: A native of Cherokee County, Kate Donaldson was a pictorial textile artist known for her so-called Cow Blankets. 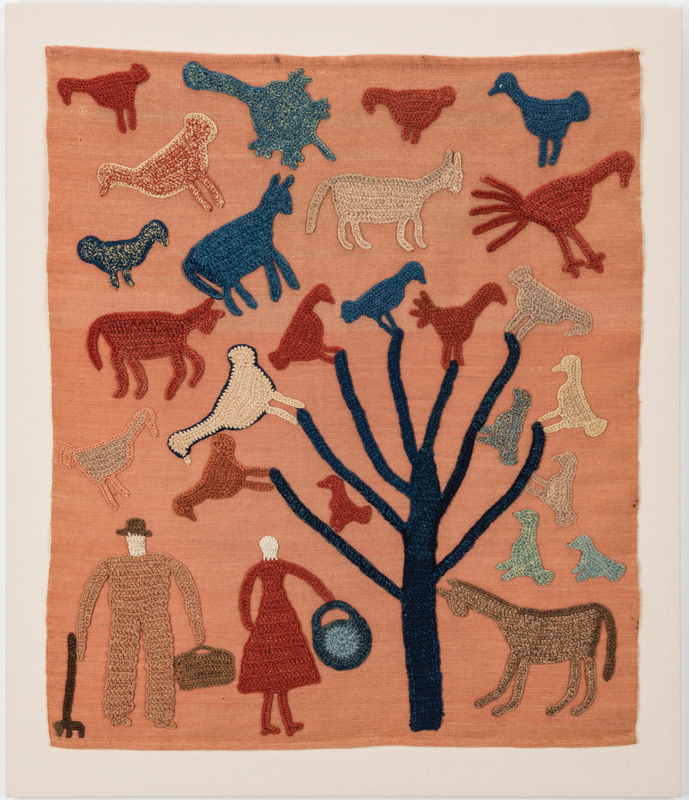 Her work is recorded in Allen Eaton's Handicrafts of the Southern Highlands and the John C. Campbell Folk School in Brasstown, N.C. See also the digital collection of the Hunter Library of Western Carolina University. 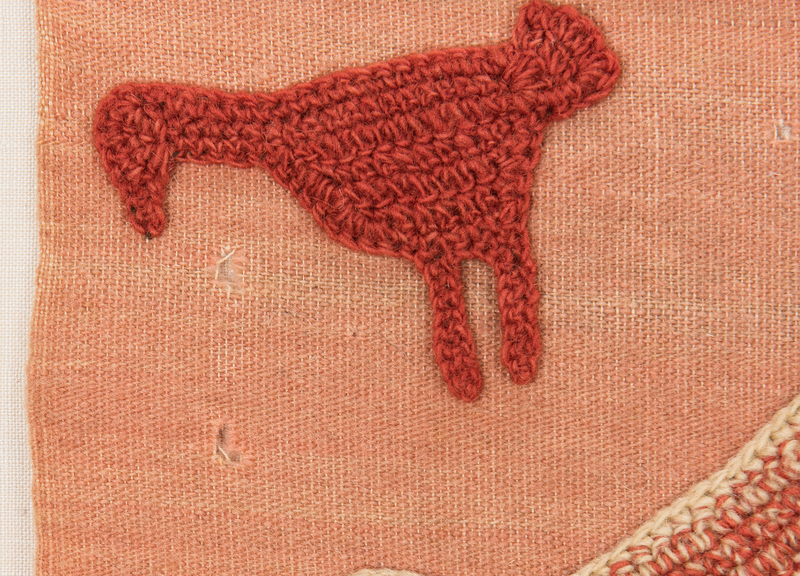 CONDITION: Overall very good condition with some minor holes in upper left quadrant.